A new theatre space is coming to the DINA arts centre on Cambridge St. this spring. Once a disused beer cellar in the venue’s previous guise as The Cutler pub, the location found a fresh purpose in December of last year when Miriam Schechter, Ben Price and Emily Compton used it for their sell-out production, Club Bazaar. 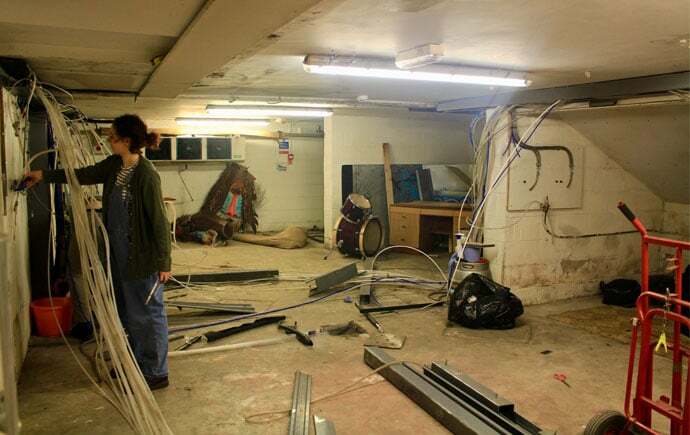 With no original plans to use the space once Club Bazaar’s run had ended, The Cellar made an impression, and Miriam and co quickly decided to renovate the old building into a safer place for audience members and performers alike. The group have set up a crowdfunding page and aim to provide an affordable space for emerging and experimental artists to work. It will also host scratch nights, artistic residencies, meet ups and workshops. As well as pushing the Crowdfunder page, they are also looking for volunteers with DIY knowledge to aid the refurbishment process. In return for any help, the group will use a time banking system to provide access to the space as a small payment for any assistance. For more information about The Cellar at DINA, visit their socials below.